This isn’t my own recipe but it’s a new discovery and I’ve made it twice in the past week so thought I would share it with you. 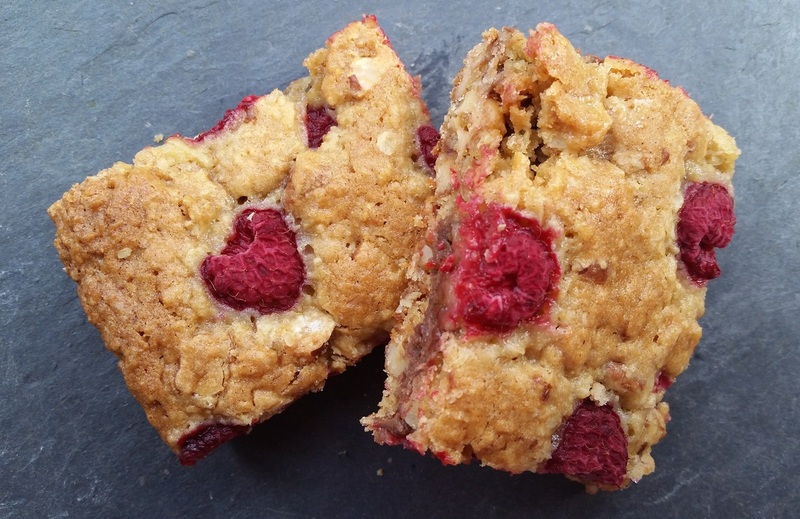 Think of it as a raspberry flapjack; a great combination! You can find the full recipe on the Sainsbury’s Magazine website here but before you get started I’ve made a few notes from my experience of baking these ‘oaties’. I didn’t have a loose-bottomed square tin so I just used a regular square cake tin and lined it with greaseproof paper and it came out fine. My tin was also a tiny bit larger that that recommended at 21cm square and I found it quite hard the first time to cover the whole tin with the mixture so the second time I increased the quantities a bit. I used 150g porridge oats, caster sugar and self-raising flour and 90g butter and syrup. I left the other quantities the same except I only had 150g raspberries because that’s the size of pack they were in but there seemed to be plenty. The second time I made the recipe I melted the syrup and butter together and found that made the mixture easier to combine. I also used the whole egg instead of just the egg yolk (much to the dogs’ disgust because using up leftover egg is their job!). That was a mistake the first time but given it didn’t seem to do any harm I repeated it the second time because I thought it would help to balance the increased quantity of dry ingredients. I found the oven temperature a bit hot. It might just be my oven but I would recommend keeping an eye on it from about 30 minutes to make sure it doesn’t over-cook. Finally, I think I’d like these without the chocolate chips but I didn’t want to try that today because we’re just off for a weekend in Skipton with my partner’s family and this batch of flapjack is my contribution. I don’t know whether the chocolate plays a part in holding the flapjacks together and didn’t want to risk a failure at this point! I’ll give that a try next time. Don’t forget you can find the full recipe here. Happy Cooking!